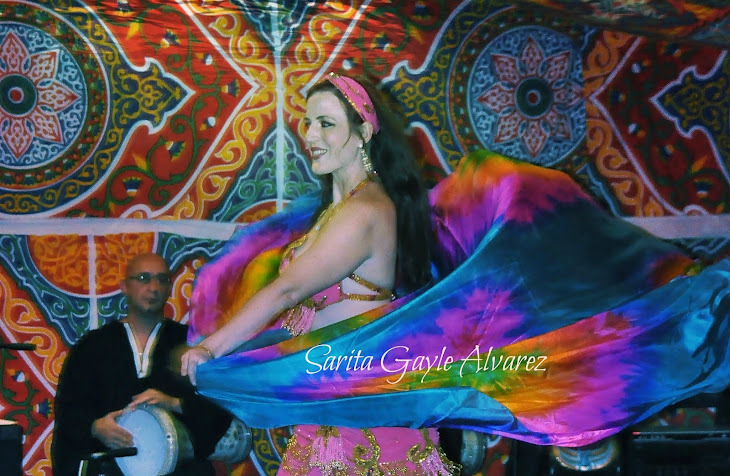 Sarita is a passionate and dedicated Belly Dance Artist based in the GTA. She has been performing and teaching for 8 years and continues to bring the joy of dance to both her audience and her students. In 2010 I made a big decision to miss Arabesque Dance​'s production of NOOR so that I could go live in Cuba for a few months with my hubby Maykel​. In Cuba, I was lucky enough to be invited to apprentice with FUZION, a dance company rehearsing and performing in Playa Santa Lucia. It was tough work, but so rewarding to be so outside of my comfort zone. Some of las embras in the group were kind enough to help me catch the pasitos after rehearsal, and in exchange I would teach them a few bellydance steps. At night we would all go out to la discoteca (that's right, it's still called a disco in Cuba!) and dance together, the ladies practicing bellydance and me practicing my latin dancing. That's how the LatinBelly seed was planted. I can't believe that was FOUR years ago. Watching this video from the first ever LatinBelly choreo I taught, I can't even believe how much my students, myself, and LatinBelly have evolved. It makes me look forward even more, as I know there is so much more growth to come!! Thank you so much to those who have supported me, mentored me, taught me and come and taken my classes. It truly is a blessing to be able to do what I love. Latinbelly is spicy, playful and tons of fun! Come dance, sweat, laugh with Sarita and learn about different Cuban rhythms & dances and how Sarita fuses these with movements from her Bellydance repertoire. Sarita will be teaching a six week latinbelly session starting Saturday March 14th from 12-1pm at Steps Dance Studio, 1 Gloucester St, 2nd Floor. $100 (+hst) for the six week session. Email Sarita at sarita.gayle.alvarez@gmail.com to reserve your spot today! Sarita is a Belly Dance Artist who has been performing in the GTA for over 7 years. She has an energetic and charming style that will enchant your guests! Sarita is available for weddings, engagements, anniversaries, birthday parties, and many other special events. Let her make your event sparkle!